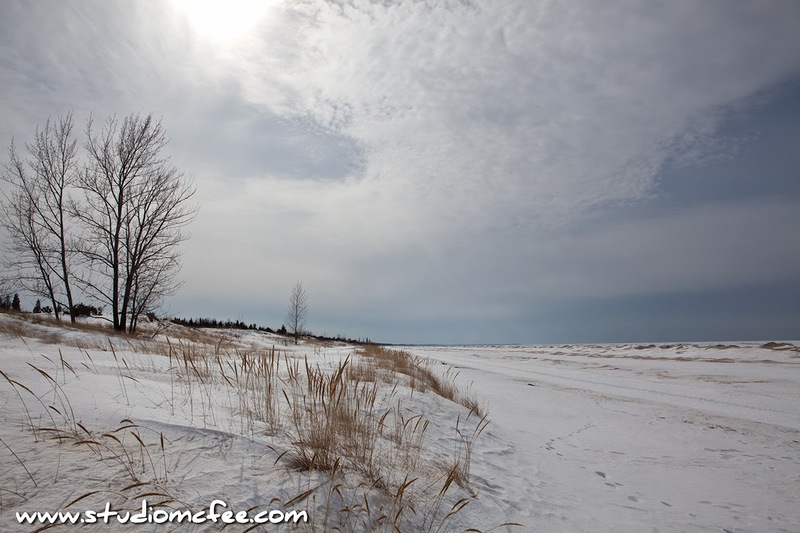 Visiting The Pinery Provincial Park in March 2014, I discovered Lake Huron to be frozen all the way to the horizon. A tranquil hike through snow along the beach confirmed that it will be some time before anyone will be swimming at The Pinery. There are, nevertheless, signs of spring now. Every few days the temperature creeps above the freezing mark. But this long cold, snowy winter has taken its toll. Spring may not 'spring' into place. What is more likely is a long end to winter as the snow melts and the frost in the ground (deeper this year) gradually leaves. Lake Huron is almost completely frozen over this year. One imagines this will slow down the impact of heat in the same way a block of ice in a cooler keeps things colder for a while. Alas, It will be a few months before we need coolers and ice.